NAMM 2013 – Roland announced a new live performance keyboard named the Roland V-Combo VR-09. The V-Combo VR-09 features 61-keys keyboard, with Roland’s SuperNATURAL technology powers the Virtual Tone Wheel organ with nine harmonic bars, plus newly developed transistor-type ‘60s organ tone, maximum 128 voices Polyphony, with both AC or battery power, LCD display, song playback via optional USB memory and free VR-09 Editor app available for iPad. If you are a gigging keyboard player, you will be looking for at least three things from your next keyboard. Firstly, you will need a diverse range of convincing sounds to help you get the gigs. Secondly, you will want to be able to edit sounds quickly when on stage, should you need to, and Thirdly, can be easily tuck under your arm after the gig and drive home. The Roland V-Combo VR-09 keyboard is an affordable, easy-to-transport rig for live performing keyboard players, with dedicated piano, organ, and synth engines containing essential tones for live use. The three sound engines are organised in three intuitive blocks on the front panel – giving fast access to the sounds you need and especially useful on a dark stage. The VR-09 is all about controlling your sound too, with nine sliders for tone shaping and a large array of knobs and buttons for tweaking the seven simultaneous effects and various parameters. Other great additions include an on board looper and a drum section packed with rhythms for practice and jamming. The compact Roland V-Combo VR-09 weight merely 5 kg, with Inspiring piano, organ and synth sounds for live use is a dream come true for gigging musicians. The new Nord Electro 4D features 61-note semi-weighted waterfall keybed – similar as the Electro 3, new physical drawbars for hands-on control, tone wheel organ engine, new Rotary speaker, USB MIDI. The new Electro 4D semi-weighted waterfall keybed is great for organ sounds and still controllable enough for playing piano-type sounds. Most notably, the addition of real drawbars that replace the lights and buttons on the previous electros has transformed the Electro 4D into a real player’s instrument when playing live. Also included is an expanded delay effects section with tap tempo button, rate, a stereo ping-pong mode, and amount controls. The Electro 4D organ engine is Nord’s flagship organ derived from Nord C2D. The piano engine is still similar but, now there is a long release function which adds a more realistic long decay to the acoustic piano sounds. This is a subtle addition but one that adds much again to the overall authenticity. Additionally, four live locations and 4 preset banks give an unprecedented amount of freedom with presets, and Nord finally provides MIDI flexibility, making the USB port a USB-MIDI interface. The Nord Electro 4D simple layout, unmatched sound quality and classic control surface, an evolutionary upgrade. One thing though, the Electro 4D is mono-timbral, so no layering or splitting of organ and piano sections can be done at a time. The tough, compact and ultra portable Nord Electro 4D SW61 61-Key Portable Keyboard weigh merely 7 kg. Korg’s brand-new Music Workstation, the KRONOS unveiled at the recent 2011 NAMM show. Kronos is more than a new instrument. It is a single keyboard instrument that brings together multiple synthesis sound engines in Kronos. Korg Kronos features 61-keys, 73-keys or 88-keys, the 61-keys features semi-weighted action whereas, the 73 and 88-keys feature fully weighted hammer-action keyboard. Kronos boasts a complete nine different synthesis sound engines, new interactive performance features, as well as a host of tactile elements, including a new 8″ color touch screen, for easy access to parameters and real time control. The foundation of any keyboard instrument is the piano and no workstation would be complete without piano sounds, and the Kronos is no exception – a choice of acoustic piano; German Model D – grand and Japanese C Model – robust (presumably based on Steinway and Yamaha grands, respectively) pianos are available using the SGX-1 engine, and each has been sampled at eight velocity levels per key. Their realism is further augmented by the fact that none of the samples are looped, and both models recreate the sound of key and pedal noise, and sympathetic string resonance. Naturally, classic electric piano sounds are also incorporated and are accessible via the EP-1 engine and these sounds are generated on the fly using what Korg call Multi-Dimensional Synthesis (MDS) technology. Six electric piano models are available and due to their synthesized nature each can be extensively tweaked. The EPS-1 engine also includes emulations of cabinets, amps, speaker and vintage effects. Additionally, a tonewheel organ model is also present, and this comes courtesy of the CX-3 engine. Another modelled affair, this recreates the sound of the classic Hammond organ, complete with valve amplifier, vibrato/chorus and the obligatory Leslie cabinet. The imperfections of the original, including leakage, tonewheel noise and pitch instability, have also been obsessively analysed and recreated. STR-1 is a string-synthesis engine, besides generates guitar, harp, harpsichord, clavinet and other real stringed-instrument sounds, user can also create entirely new sounds. It also allows user to use the synthesis engine to process external audio sources, via the Kronos input jacks. The remaining five sound-generation engines are based either on traditional synthesis techniques or classic hardware synthesizers. The MS20 EX and Polysix EX emulations from Korg Legacy collection have been incorporated here, with MS20 patching achieved via the touchscreen, and the Polysix EX featuring the original classic arpeggiator. Korg KRONOS Music Workstation, there is a lot to mention about this monstrous music workstation and many more than could be mentioned here. The portable keyboard comes complete with all of the extras required of a modern workstation, and has exceeded the demands of the modern player. The KRONOS is a single keyboard instrument designed for live performing musicians, artists creating in a studio or computer-based production environment and for musicians and sound designers seeking the ultimate synthesizer. Weight 12.5 kg, 20.3 kg and 23 kg respectively. CME Pro debuted their newest master keyboard at the recent 2011 NAMM show in Anaheim, the Z-KEY. Having had more than eighteen years of experience incorporating with the latest technology, CME’s new Z-Key would no doubt differentiate it from other product brands on the market. The CME Z-Key 76 Master Keyboard features 76 Zenith keys semi-weighted action keyboard, with velocity sensitivity and after-touch, Pitch and Modulation wheels, premium quality aluminum casing, assignable Data Dial, Standby button, MIDI OUT, USB port, Sustain Pedal jack. The robust Z-Key Master Keyboard incorporates an entirely new keybed design, utilizing one-piece integrated felt-strip and after-touch, which produced better and more consistent action. Perhaps, what differentiate the Master keyboard from other product brands is the Zenith keys, with acoustic piano touch. The feel of the weighted action keys is nice if you have tried the acoustic pianos. Additionally, each key on Z-Keys is individual hence, the keys can be adjusted individually for touch and response. The Z-Key is class compliant with Windows XP, Vista and 7, and Mac OS X. The Master keyboard also comes in 49-Zenith keys, 61-Zenith keys, 76-Zenith keys and 88-Zenith keys, and all with velocity sensitivity keys and after-touch. The CME Z-Key Master Keyboard is packed in an aluminum casing for durability. The robust portable keyboard is designed for discerning users and is affordable. If you are looking forward to a pro MIDI keyboard with acoustic piano touch, and in a unique designed casing, then CME Z-Key is the perfect choice. At the recent 2011 NAMM show in Anaheim, Kurzweil announced the released of a wide array of exciting new products, and one of its pro products is Kurzweil SP4-8 Stage Piano. The SP4-8 is a strong new addition to SP4 series stage pianos and family. The SP4-8 features 88-note hammer-weighted action keyboard, with velocity sensitive adjustable keys, 16 character LCD display, 64 Voice Polyphony, 16 parts Multi-timbral, 128 factory presets, 64 user presets, 128 MIDI setups, timbre knob, Effects, Pitch and Modulation wheels. The Kurzweil SP4-8 Stage Piano delivers world-class sound quality with 128 programs migrated directly from Kurzweil PC3 sounds, including acclaimed famous Triple Strike Grand Piano, classic electric pianos, lush strings and KB3 organs, along with top notch orchestral instruments like basses, guitars, winds, brass, percussion and drums. In addition, the SP4-8 is user-friendly, with four programmable zones the stage piano enables musicians to create splits and layers with the touch of a button. The SP4-8 provides important features right where musicians want them and everything is laid out so that players can be up and running and making music right out of the box. Instantly control effects parameters using the timbre knob and customize sound without having to dive into menus. Also, the SP4-8 can save and import sounds and setups as you like. Its 16-part multi-timbral architecture makes the SP4-8 a powerful tool for writing and recording music in conjunction with an external sequencer or Desktop Audio Workstation. 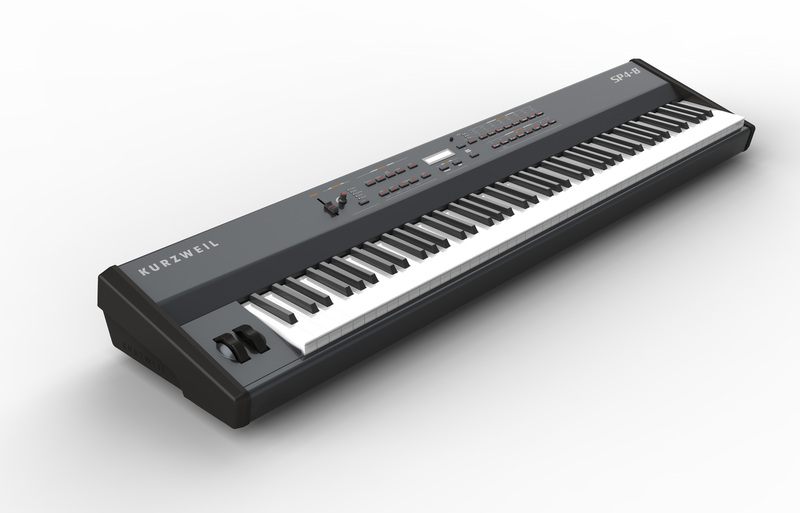 Despite features 88-note hammer-weighted action, the Kurzweil SP4-8 nevertheless is rather portable. Weighing 39 lbs, the portable keyboard is perfect for professionals who require 88-note hammer-weighted action, advanced performance features, nuanced sound design, slim, lightweight and easy to use.